Today I’m going to take you inside the most disrespected, criticized, lambasted and just plain ignored investments on the market today. Simple. Because if you’re not as rich as you’d like to be, these unloved income plays are the perfect way to get you there. 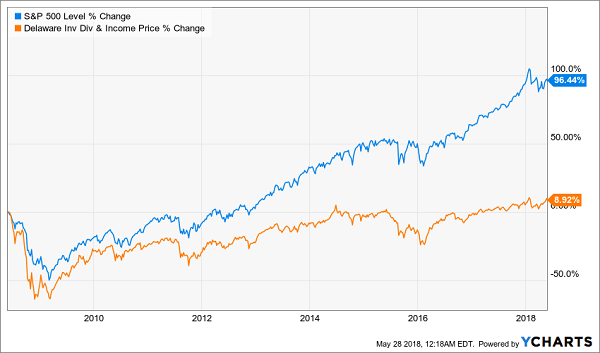 I’m talking about closed-end funds (CEFs), a group of investments that, with a bit of effort (which I’m happy to put in for you) can hand you big, fast upside, safe cash dividends of 8% and higher—or both. So why do so many investors see CEFs as perennial money losers? 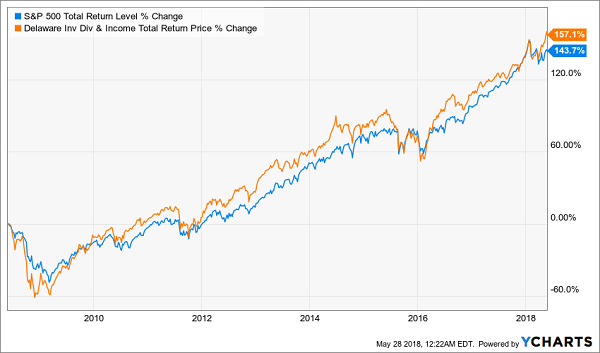 Let’s take a look, using a pick every dividend fan should know about (but doesn’t) as an example: the Delaware Investments Dividend and Income Fund (DDF), a CEF with a massive 11.2% dividend yield and boasting a history of outperformance nearly everyone has missed. Never heard of DDF? I’m not surprised. It has only $92.9 million in assets under management and a 2.1% expense ratio. Both of these set off alarm bells in most investors’ minds. Massive fees! A tiny fund! A Complete Dud … Right? That’s right: as I said above, this tiny fund is beating the market and has been doing so most of the time over the last decade. Also, it currently trades 3.5% below its net asset value (NAV, or the real market price of its holdings), so you’re getting DDF’s portfolio, its 11.2% dividend yield and its outperformance at a discount. And since this performance is post-fees—a point I can’t stress enough—we can say with confidence that DDF’s fund managers are earning their keep, despite how high those fees appear to be at first glance. Now DDF isn’t looking so easy to dismiss, is it? When it comes to CEFs, fear of market underperformance is just one issue I hear from investors. The bigger one is that these funds actually lose money over time. Again, these folks are looking at the wrong chart. It’s true that many CEFs have had their market price decline slightly over time, although in most cases those CEFs have also paid a big income stream at the same time. If the market price goes down 1%, but investors have had a 9% dividend at the same time, investors still have a strong positive total return of 8%. And that return is given out as cash, investors can use that money however they wish—whether it’s using the money today or reinvesting it in the CEF. The control is yours. Good luck doing that with your typical S&P 500 stock! And even better, unlike stocks, some CEFs are specifically designed to give you tax-free dividend payouts, like the two funds I reveal here. But do they still, on average, earn a profit? Of the near-500 closed-end funds tracked by my CEF Insider service, only 37 have suffered a loss over a long period of time. And 29 of those are relatively new funds whose losses have happened over the last couple years. When looking at funds with a 10-year track record or longer, only eight have had a negative return over the last decade. That’s a miss rate of 1.6%! And when we look at the eight money losers, the cause of their problems becomes obvious. Three of these CEFs—the Central Europe, Russia & Turkey Fund (CEE), Latin American Discovery Fund (LDF) and Korea Fund (KF)—are emerging-market funds whose assets have been under attack from a strong dollar, declining energy prices and growing geopolitical instability. Another three—the Cushing MLP Total Return Fund (SRV), GAMCO Global Gold Natural Resources & Income Fund (GGN) and Adams Natural Resources Fund (PEO)— focus on commodities and energy stocks and have been hit by the crash of 2008–09 and the 2014 oil-price collapse. That just leaves two funds—the Alpine Global Dynamic Dividend Fund (AGD) and the Alpine Total Dynamic Dividend Fund (AOD). Notice something in common? That’s right: the same firm has managed both and, to put it bluntly, both were poorly run. There has been pressure on these two funds for years because of this poor management, which is perhaps why Alpine Funds agreed to hand over control to Aberdeen Asset Management in early May 2018. And since Aberdeen has a better track record and high-quality managers, there’s good reason to expect AGD and AOD to stop losing money and finally become profitable. Simple: if you avoid CEFs whose underlying assets are being hit by political turmoil, economic headwinds or poor management, you’ll give yourself a great shot at earning a nice gain and a hefty income stream over time. All you need is a no-risk 60-day trial to my CEF Insider service. And your timing is perfect, because I’m making a limited number of these trial memberships available now. Simply CLICK HERE to start your no-obligation trial. When you do, you’ll get instant access to the names, tickers and my complete research on each and every one of the 16 buy recommendations in the CEF Insider portfolio. These 16 bargain CEFs trade at absurd discounts to NAV that are slowly narrowing. That puts unrelenting upward pressure on their share prices and sets us up for a market-crushing gain in the next 12 months! Right now the portfolio boasts an average yield of 7.4%. But remember, that’s just the average! Cherry-pick my 3 highest-yielding funds and you’ll be pocketing life-changing payouts like 9.6%, 8.4% and 8.3%! I hope you’ll take this opportunity to join the small group of investors across the country who are pocketing regular—and mostly monthly—dividend checks from these 16 funds. And to sweeten the pot further, I’ll also GIVE you my latest Special Report FREE! This exclusive guide reveals the names, tickers, buy-under prices and more on my 4 very best CEFs to buy now. Grab these 4 cash machines now and you’ll trigger a 7.6% average income stream and position yourself for 20%+ upside in the next 12 months!